There’s no better way to celebrate the holidays than by preparing a festive Nuts and Bolts Recipe. With its finger-licking-good seasoning and satisfying crunch, Nuts and Bolts are traditionally made of a combination of seasoned cereals, nuts, pretzels and other crunchy morsels like sesame sticks or spicy wasabi peas. The popular Christmas party snack, also known as Nuts n Bolts, has been delighting carb, garlic and nut loving snack fans around the holidays for decades! Our easy Nuts and Bolts Recipe ready for snacking. Classic Nuts n Bolts offer a humorous take on the “nuts and bolts” commonly found in a handyman’s workshop. 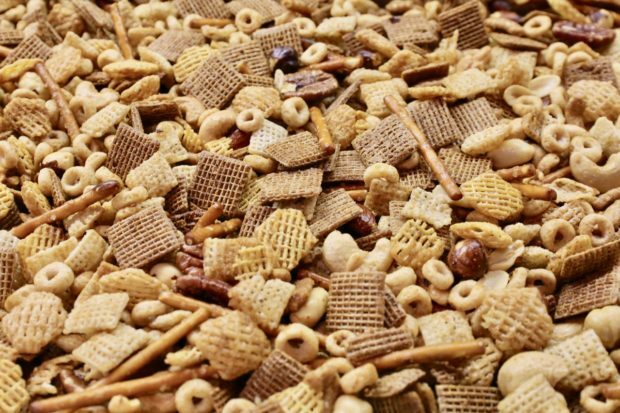 The holiday snack mix features pretzel sticks (the bolts) and nuts (which take on the form as Cheerios, as well as mixed nuts). 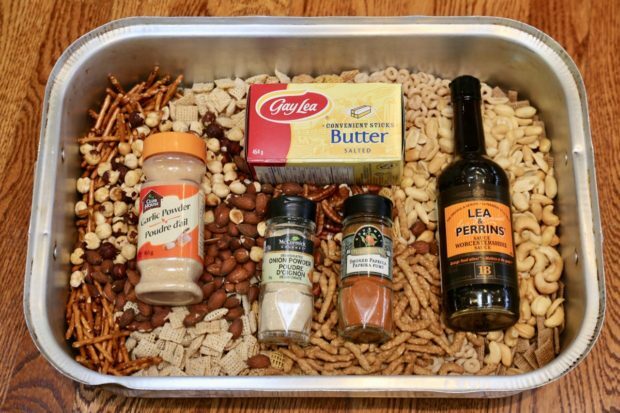 Nuts and Bolts recipes vary wildly based on family tradition but the majority consistently feature Chex and Cheerio cereal as well as roasted nuts and pretzel sticks. 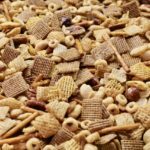 The recipe is so easy to customize that many families develop their own signature snack mix each year at Christmas. 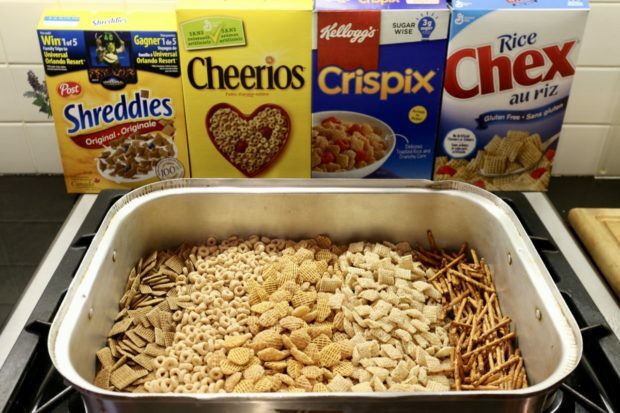 Shreddies, Cheerios, Crispix, Chex and Pretzels are the heart of every Nuts and Bolts Recipe. Nuts and Bolts recipes first popularized in America and Canada and are traditionally considered a North American holiday snack or party mix. Today, the popular holiday snack is enjoyed all over the world, 365 days a year! My sister and I looked forward to the cooler months in Canada as we knew our parents would prepare the families Nuts and Bolts recipe each Thanksgiving. It’s an easy recipe to make with children as it’s fun for kids to dump out all those cereals and nuts. There are no knives or flames required so it’s a safe and fun holiday tradition to enjoy with the whole family. It doesn’t hurt that our Nuts and Bolts recipe tastes great too! Enjoy making our Nuts and Bolts recipe year round with a bottle of your favourite craft beer. Most people usually dust off their Nuts and Bolts recipe during the holidays as they’re a fixture at Christmas parties. My family loves our nuts and bolts recipe so much that my parents have extended the “party mix snacking season,” from Canadian Thanksgiving until after Christmas. I love this Chex mix so much that I make it year round, and you should too! Christmas Party: the most popular time of year to prepare a traditional Nuts and Bolts recipe is during Christmas. I like to serve them around the home in separate bowls to encourage guests to move. Thanksgiving Dinner: we traditionally prepare our first Nuts n Bolts recipe of the season during the Thanksgiving holidays. Family and friends who arrive for turkey dinner know to march straight into the kitchen to enjoy pre-dinner snack mix munching. 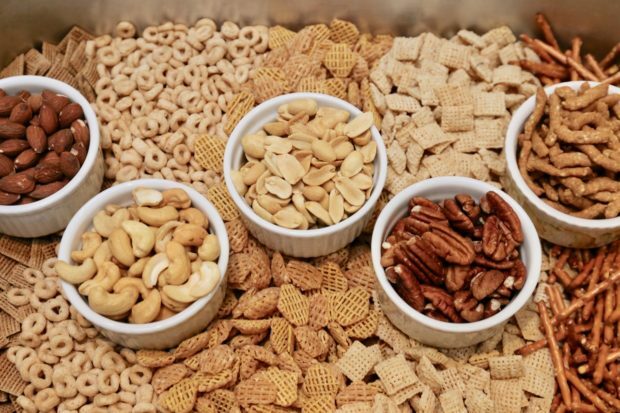 Super Bowl Snacks: if you’re a sports fan, there’s no better way to liven up a beer-sloshed gathering than with a well seasoned snack mix dotted with mixed nuts. Oscar Party: if sports aren’t your thing, you’re likely more keen to gather for an Oscar, Golden Globe, Grammy, Emmy, or RuPaul’s Drag Race Party. Serve our Nuts and Bolts recipe and your friends will be licking the bowl clean. Cottage and Camping: if you store your nuts n bolts in an airtight container they’re a great snack to enjoy on your next camping trip. 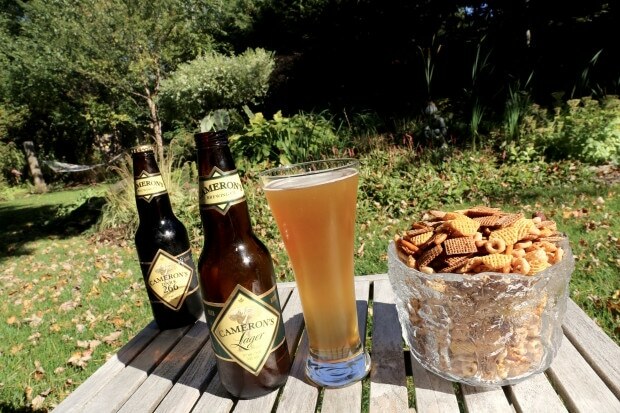 Or if you’re planning to relax at the beach or lazing at the dock during the summer it’s the perfect snack mix to enjoy with a cold beer while tanning. Customize your Nuts and Bolts recipe by stirring in your favourite nuts. Our Nuts and Bolts Recipe features an easy to prepare 5 ingredient sauce. Toss your Nuts and Bolts recipe with a sauce featuring butter, Worcestershire sauce, garlic powder, onion powder and smoked paprika. We’ve spent decades fine tuning our families Nuts and Bolts recipe. Because Nuts n Bolts are an easy to prepare party mix, you can add or remove ingredients to best suit your taste. Vegan Nuts and Bolts Recipe: if you eat a plant based diet, tinker with the ingredients in the Nuts and Bolts sauce. Swap out butter for a mixture of coconut oil and olive oil. Gluten-free Nuts and Bolts Recipe: if you’ve got Celiac it’s easy to prepare a gluten-free nuts and bolts recipe. Many of the cereals today are made of oats, rice and corn. Simply swap out pretzels and Shreddies for your favourite gluten-free options and enjoy! Nuts and Bolts for Garlic Lovers: I’ve met many nuts n bolts lovers who add twice the amount of garlic in their recipes. Feel free to kick it up a notch until you’ve got the desired punch of garlic for your palette. Nut-free Nuts and Bolts: for those allergic to nuts you can absolutely leave these out. Replace the nuts cup for cup with additional cereal, or find a crunchy nut-free substitute such as wasabi peas. Dill Flavoured Ranch Nuts and Bolts Recipe: I’ve been to a few Christmas parties where the snack mix was flavoured with homemade ranch. It’s a perfect idea for those who love dill! Healthy Nuts and Bolts Recipe: the easiest way to make our Nuts and Bolts recipe healthier is by cutting back on the butter. When my parents prepare Nuts and Bolts for our family during the holidays they cut out half the fat. The nuts and bolts will be more dry and less flavourful, you’ve been warned. Another option is to add half butter and half olive oil to your sauce and play around the the proportions to suit your tastes. You can also emphasize healthier nuts and cereal to increase the vitamins and minerals as well as fibre in your nuts and bolts recipe. Celebrate the holidays by preparing our festive Nuts and Bolts Recipe. 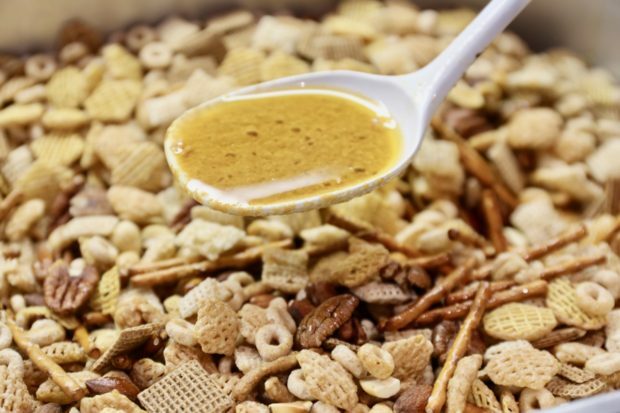 The popular holiday snack mix features seasoned cereals, nuts and pretzels. Place butter in medium pot and melt over the stove while the oven is preheating. Add Worcestershire sauce, garlic powder, onion powder and smoked paprika. Stir well to combine. In a large roasting pan combine cereals, nuts, pretzels and sesame sticks. Pour sauce into the roasting pan a half cup at a time, stirring gently to combine. Bake for 2 hours, stirring the Nuts n Bolts every 30 minutes. Once cooled, store the party mix in air tight containers or Ziplock bags.